WASHINGTON — Today and this weekend, Bernie Sanders and Kamala Harris are hitting the campaign trail — but they won't be in Iowa OR New Hampshire. One theory of the 2020 race for the Democratic nomination is that the delegate chase in the Super Tuesday states — California (Harris' home state), Texas (O'Rourke's), Massachusetts (Elizabeth Warren's), Minnesota (Amy Klobuchar's) and Vermont (Sanders') — will go a long way in determining the eventual winner. The logic: If you can rack up delegates in YOUR state as well as the COMPETITION'S home states under the Democrats' proportional allocation system, you're going to be in good shape. The other theory of the 2020 Dem race is that Iowa and New Hampshire are only more important than ever. How viable will Harris be on Super Tuesday if she can't finish in the Top 2 or Top 3 in Iowa? Are Bernie Sanders' dreams for the Dem nomination dashed if he finishes worse in Iowa than he did in 2016 (a very close second to Hillary Clinton)? Will O'Rourke, Warren or Klobuchar be players in their own states on Super Tuesday if they don't deliver in Iowa or New Hampshire? Yes, it's very early in the 2020 Democratic race. But we see two clear lanes emerging. These are Democrats who, ideologically and temperamentally, aren't all that different from Barack Obama (or where Obama would be if he were running in 2020). Kamala Harris stumps in Texas… Beto O'Rourke is in South Carolina… Bernie Sanders hits San Diego, Calif…. Tulsi Gabbard remains in New Hampshire… And John Hickenlooper also is in the Granite State. 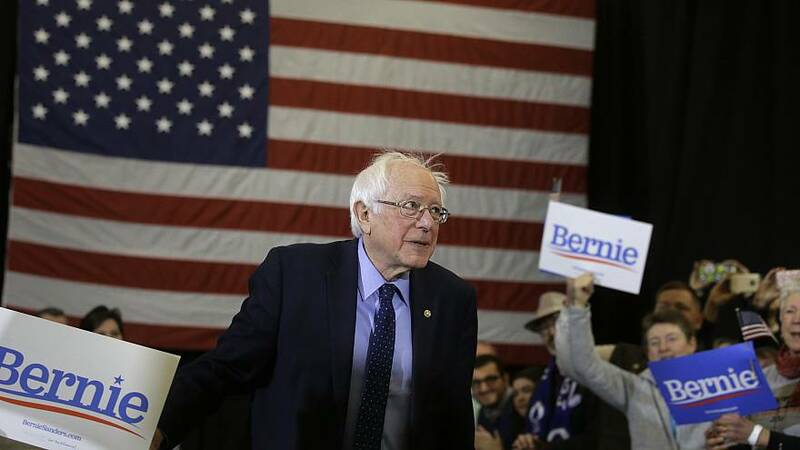 On the campaign trail Saturday: Harris holds a rally in Houston… O'Rourke stays in South Carolina, where Pete Buttigieg and Cory Booker also make swings… Bernie Sanders heads to Los Angeles… And Amy Klobuchar, Elizabeth Warren, Gabbard and Hickenlooper campaign in New Hampshire. On the campaign trail Sunday: O'Rourke heads to Nevada…While Harris goes to Atlanta, Ga… Kirsten Gillibrand delivers her campaign kickoff speech outside of Trump International in New York… Bernie Sanders holds a rally in San Francisco… And Warren, Gabbard and Hickenlooper are in New Hampshire. Yesterday we wrote how unprecedented an active role the Trump White House is playing in another country's election - with Israeli Prime Minister's Netanyahu's visit to the White House next week ahead of his April 9 election. Well, here's another favor Trump is doing for Netanyahu: The president yesterday announced on Twitter that the U.S. is recognizing Israel's sovereignty of the Golan Heights. Netanyahu told reporters, per NBC's Andrea Mitchell: "President Trump has just made history. I called him. I thanked him on behalf of the people of Israel. He did it again!...The message that President Trump has given the world is that America stands by Israel." As for the policy change, the United States recognizing Israel's sovereign claim to the disputed Golan Heights has serious repercussions. As former Middle East peace negotiator Martin Indyk told the New York Times: "Putin will use this as a pretext to justify Russia's annexation of Crimea," he said. "The Israeli right will use it as a pretext for Israel's annexation of the West Bank. It is a truly gratuitous move by Trump." That's the share of Republicans who AGREE with this statement, per a new Pew Research Center survey: "Having a majority of the population made up of blacks, Asians, Hispanics and other racial minorities by the year 2050 will WEAKEN American customs and values." The negative view of a majority-minority country isn't limited to Republicans. About one-in-five Democrats agree that a white minority in the U.S. will weaken the country's cultural fabric. But, big picture: Don't forget the ways that Trump has said the quiet thing out loud here. He's referred to immigration at the southern border as an "invasion"; he's supported a ban on Muslims entering the United States during his campaign; and he's reportedly used slurs to describe immigration from Haiti and some African countries. Don't miss the pod from yesterday, when we looked at some conspicuous cherry-picking of polls by one 2020 candidate. Several 2020 Democrats say they'll boycott AIPAC after MoveOn called for candidates to skip the conference. The U.S. says the door is "wide open" to more talks with North Korea. Mississippi has signed a "heartbeat" bill into law, banning abortions after only about six weeks of pregnancy. The New York Times traces the origins of "Jexodus." Nearly six in 10 Republicans say a majority-minority in the United States by 2050 would "weaken American customs and values." And speaking to SiriusXM's Julie Mason, former Vermont Gov. Howard Dean said he thought Joe Biden making Stacey Abrams his VP pick was a good idea.